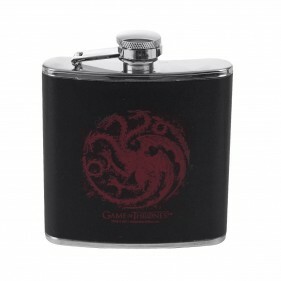 Breathe a little fire into your night with the Game of Thrones House Targaryen Flask. The 6-ounce stainless steel flask features the House Targaryen sigil of the three-headed dragon printed in red on the faux leather wrap and comes with a funnel, making refills easy. Show your inner dragon and Game of Thrones fan with this fantastic flask.